State of the Waratah provides a colourful look at the New South Wales floral emblem; its history, cultivation and application as an image in art, design, fashion and architecture. Curator Rosie Nice has brought together an eclectic range of waratah-inspired art and craft on loan from major galleries, museums and libraries throughout Australia. 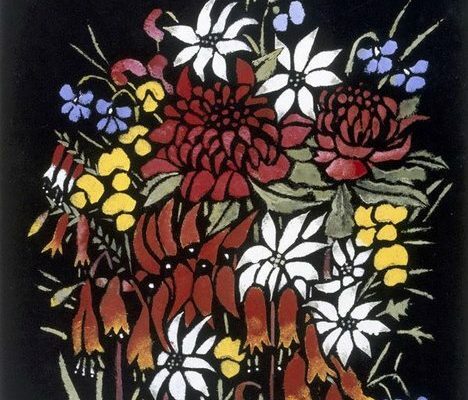 State of the Waratah will explore the Aboriginal story, display wartime memorabilia, include paintings, drawings and photographs from artists such as Ellis Rowan, Margaret Preston and Bruce Goold, and showcase waratah-inspired fashion. From private collections there will be pieces never exhibited previously such as a bowl and jug featured in RT Baker’s famous book, Flora in Art in 1916. A lively program of public events will be held at both S. H. Ervin Gallery and the Gardens to coincide with the exhibition, and a self-guided ‘Waratah Walk’ will link both venues, visiting places in the city that feature hidden waratah motifs, such as The Garden at Darling Park and the terrazzo waratah at Skygarden in Pitt Street Mall. An official event of the Sydney 2000 Olympic Arts Festival, State of the Waratah will be an inspirational experience for both Sydneysiders and tourist alike: vibrant, attractive, informative and with a hint of nostalgia! Presented by the Royal Botanic Gardens Sydney, together with the National Trust S. H. Ervin Gallery. Sunday 10 September – Rose Nice, curator of ‘State of the Waratah’, will discuss her passion for waratahs and the wealth of waratah-inspired works of art, design, fashion, craft, ephemera and memorabilia in the exhibition. Margaret Betteridge is curator of the Sydney Town Hall collection and self-confessed telopeaphile. Margaret’s expertise is in decorative arts and she will discuss the decorative art objects in the exhibition. Sunday 8 October – Bruce Goold’s woodblocks are exhibited in ‘State of the Waratah’. He has also designed the logo for the exhibition. Bruce will discuss works by Margaret Preston, Grace Cossington-Smith and Adrien Feint included in the exhibition and will also refer to his own prints. Suzanne Archer, artist and previous winner of the Wynne Prize, is represented in the ‘State of the Waratah’ exhibition. Suzanne will discuss her 1994 Wynne Prize painting, Waratahs, Wedderburn.